1. How will engaging students in science and engineering practices help improve science education? 2. What do the eight practices look like in the classroom? 3. How can educators teach the practices to support the NGSS? 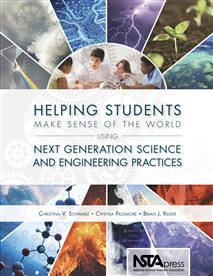 Helping Students Make Sense of the World Using Next Generation Science and Engineering Practices was developed for K 12 science teachers, curriculum developers, teacher educators, and administrators. Many of its authors contributed to the Framework s initial vision and tested their ideas in actual science classrooms. If you want a fresh game plan to help students work together to generate and revise knowledge not just receive and repeat information this book is for you. Book is available for purchase on Amazon. A new book on the use of literacy to teach science, co-authored by Sacramento Area Science Project previous director Arthur Beauchamp, has been recommended by the National Science Teachers Association. 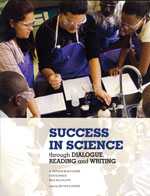 “This book offers an innovative framework to meet the new national standards while involving disengaged students in comprehending science texts and developing their proficiency in science. . . . For those that say, ‘Wait a minute, I’m not an English teacher,’ Success in Science is an understandable and well–written support.” Read the full review here. Only one in five submissions meet their standards for recommending on the NSTA Recommends portion of the national website. Click HERE to order using your credit card.